Yamoa powder has been traditionally used in Africa to treat asthma, allergies, hay fever, and other respiratory conditions. It has been traditionally used to aid recovery from respiratory and allergic conditions. 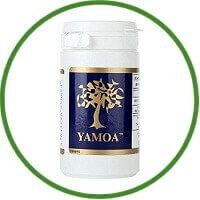 Yamoa Powder is an herbal remedy that originates from West Africa, and has been handed down throughout the generations. It is a totally natural substance made from the ground bark of a unique gum tree found in West Africa, and it contains no other additives. It is non-toxic, and manufactured to full International GMP standards. It stimulates the immune system and has even shown potential in the lab to fight infectious disease. It does not cause drowsiness. 60 Capsules last approximately one month.